← LOOK WHO MADE THE COVER OF THIS CATALOG FOR SUMMER 2011! I just waved a Q-Tip saturated with insecticide around the female carpenter bee to deter her to continue drilling this hole underneath the box hole. After I knew she had left for good, I took the Q-Tip and just rubbed the inside of this partially drilled hole. She never returned. It's the female carpenter bee that drills the holes. Now I need to caulk and even out this this partially-drilled hole. Every year on the trail, I find something new to deal with regarding “problems” — some problems are larger than others. In this case, I discovered my problem was actually easier to deal with than I had expected. 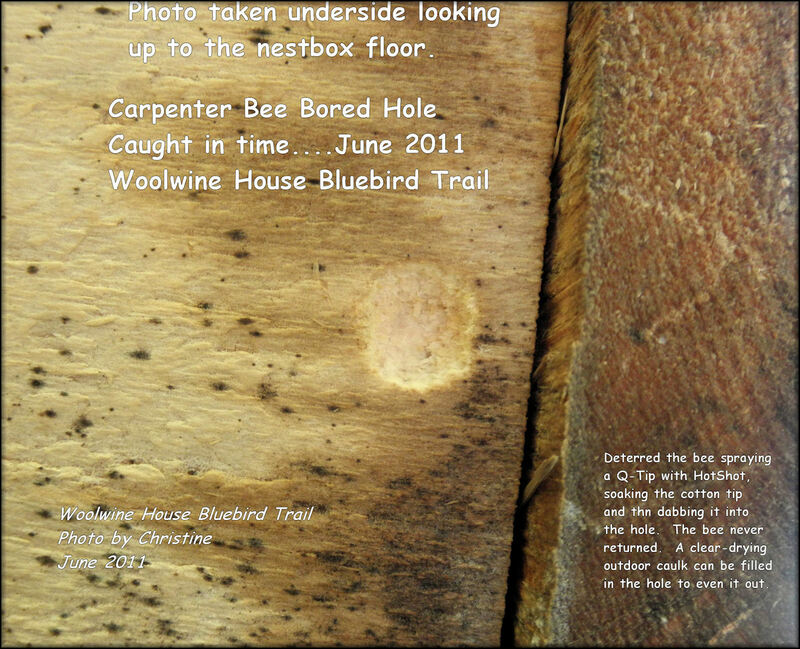 I found a spinning carpenter bee boring a hole in one of my nestboxes! The bee was spinning her whole body around while drilling into the underside and outside of the nestbox’s floor. Thankfully, a partial bluebird nest was built–temporarily abandoned as my theory goes–possibly BECAUSE that bee was there. Bluebirds and other cavity-nesting birds will abandon a nest location (whether it be natural or manmade) if pests such as bees and wasps attempt to occupy the cavity. I have detailed how I took care of the carpenter bee on the PROBLEMS tabbed page of this site, including two new photos. Be sure to check it out. This is not something I’ve seen before at my nestboxes, so hopefully it won’t be a recurring issue! GOOD NEWS: I have an active bluebird female incubating 4 eggs in that box today! This is why MONITORING is so helpful to our native birds using our nestboxes–my point is: why even bother taking the time and effort and expense of putting up nestboxes if the birds cannot use them? Keep an eye on your backyard nestbox or a trail of nestboxes. Be an attentive “landlord” and make sure the birds can really use them.